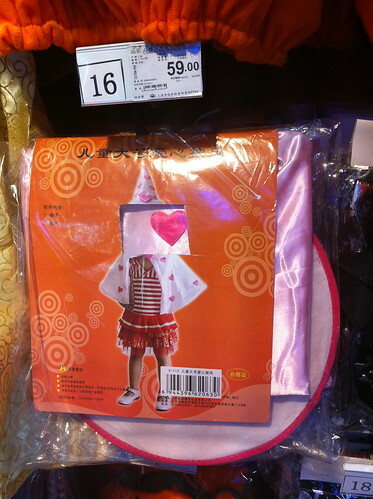 Elaine’s picture removed from Halloween products – the Chinese way! 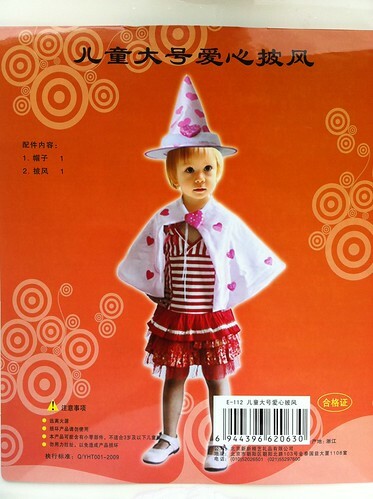 Two weeks ago Grace was shocked when she found that a big Chinese manufacturer had used Elaine’s picture on the packaging of one of its Halloween costumes. We discussed what to do and decided to contact the company and ask them to change the packaging, otherwise we would start a court case. The company at first tried to brush Grace off by asking for proof that Elaine was our daughter. But when she explained who she is and sent them a link to her verified Weibo account (where the case had already been discussed in detail) their tone changed immediately. They promised to change all the packaging in China before October 21. So when we went to the opening night of the Carrefour Wine Fair yesterday we also checked out the Halloween customes there. 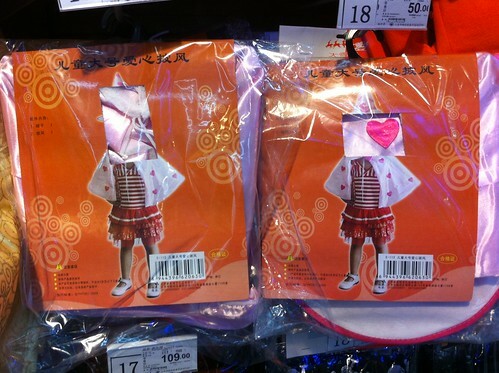 Indeed the manufacturer had changed the packaging, but in a typical Chinese way: Instead of inserting a new cover, they had taken out all covers and cut out Elaine’s face! We’ll check a few more stores over the next days. If the products there all have the same ‘solution’ we are okay. If not we have a lawyer lined up to sue the company. We told the law firm that they can keep all the money they get in compensation. We don’t want it and it will be a good motivation for them to win this case! I’d let the lawyers have at it. A little photoshop mashup is fine, but on nationally distributed products in major department stores? Too far. It didn’t occur to them to offer a nominal modeling agreement? Might have cost them less than the amount required to pay people to cut off her face manually.